The Royal Order of Sartorial Splendor: Royal Newsflash of the Day: It's a Boy for Crown Princess Victoria and Prince Daniel! 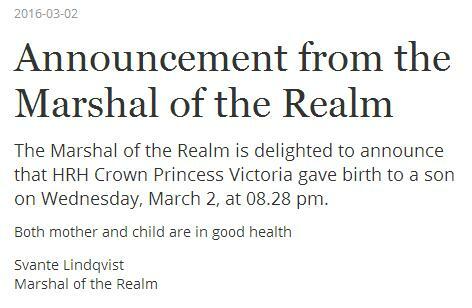 Royal Newsflash of the Day: It's a Boy for Crown Princess Victoria and Prince Daniel! We interrupt your regularly scheduled sartorial chatter for this happy news: a new prince has been born in Sweden! 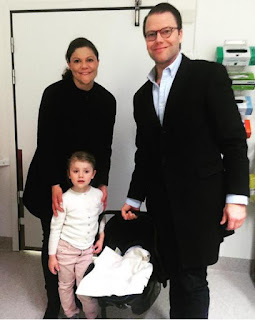 Prince Daniel met with the media and said that Princess Estelle was sleeping and would wake up to news of her baby brother. Tomorrow, the family's traditional Te Deum will be held at the Royal Chapel to celebrate the baby's birth. UPDATE: We have a name! The King announced it Thursday in a cabinet meeting.